Long QT syndrome (LQTS) is a heart disorder that carries an increased risk of fast, chaotic heartbeats, caused by changes in the electrical system of your heart. This can lead to fainting and, sometimes, to sudden death. It can also cause sudden, uncontrollable arrhythmias (heart rhythm disorders) in response to exercise or stress. LQTS is believed to be a problem with the tiny pores – or ion channels – that allow electrically charged ions to flow into the heart. If these pores aren’t working right, or are too few in number, it disrupts electrical activity in the ventricles and causes dangerous arrhythmias. LQTS can be caused by a genetic mutation that a person inherits or can be brought on by certain medications. The goal of treatment is to prevent life-threatening, abnormal heart rhythms and fainting spells. This is not a cure, but greatly improves survival with this condition. 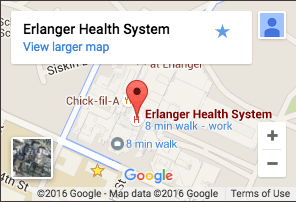 The electrophysiologists at Erlanger Cardiology are leaders in the diagnosis and treatment of Long QT Syndrome and other heart rhythm disorders (arrhythmias). Contact us to learn more.